Air operations are vital to supporting numerous plans and operations conducted at all levels of government, military, and the private sector. Proper planning and coordination are essential to conduct safe and coordinated aviation operations during contingencies, disasters, and major events. 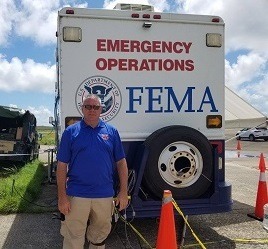 Under contract with FEMA, IEM is conducting airfield site assessments, operations planning (OPLAN), aircraft ground support, and passenger support for mass air evacuations of at-risk population centers. Support will also be made available for air operations during non-emergencies, emergencies, and military contingencies, as well as humanitarian operations. IEM is conducting airfield site assessments using former Air Mobility Command (AMC) airfield survey team members, Air Mobility Liaison Officers (AMLO), and Contingency Response Wing (CRW) personnel. IEM’s assessment teams use a modified AMC Form 174 – Airfield Survey Form. These airfield site assessments are accepted by FEMA, the U.S. Transportation Command (TRANSCOM), and AMC to update the airfield suitability and restrictions reports (ASRR) database and conduct planning. 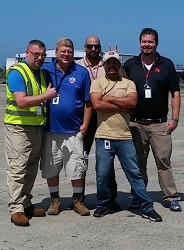 In April 2011, IEM was awarded a five year IDIQ contact providing aircraft, flight crews, and ground support for FEMA. It supports both non-disaster transportation as well as Stafford Act disasters. In July 2010, IEM began work on the Airport Cooperative Research Program (ACRP) 4-10 to support airport-to-airport mutual aid programs (MAP). IEM was recently awarded two additional contracts: ACRP 4-12 and 4-13. To support ACRP 4-12, IEM is developing a guidebook to be used by airport staff to evaluate and implement web-based collaboration tools that provide a common operating picture for both day-to-day operations and full emergency response management. 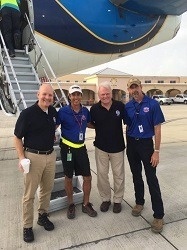 As part of IEM’s support to ACRP 4-13, we are providing research to develop a model Community Emergency Response Team (CERT) program for the airport community that includes (1) an awareness plan and description of benefits, (2) implementation guidance, and (3) steps for integrating into airport emergency response planning. IEM’s “Air Ops” team is now certified by the Federal Aviation Administration (FAA) to commercially-fly drones (a.k.a., UASs, sUASs, and UAVs). 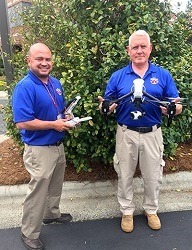 The Air Ops team consists of former military, commercial, and private aviators who are FAA part 107 certified and insured to fly these unmanned systems. IEM has commercial-grade drones and already has active contracts that utilize our UAS/UAV capabilities. IEM Air™ provided air operations support to survivors of Hurricanes Irma and Maria in the U.S. Virgin Islands and Puerto Rico.